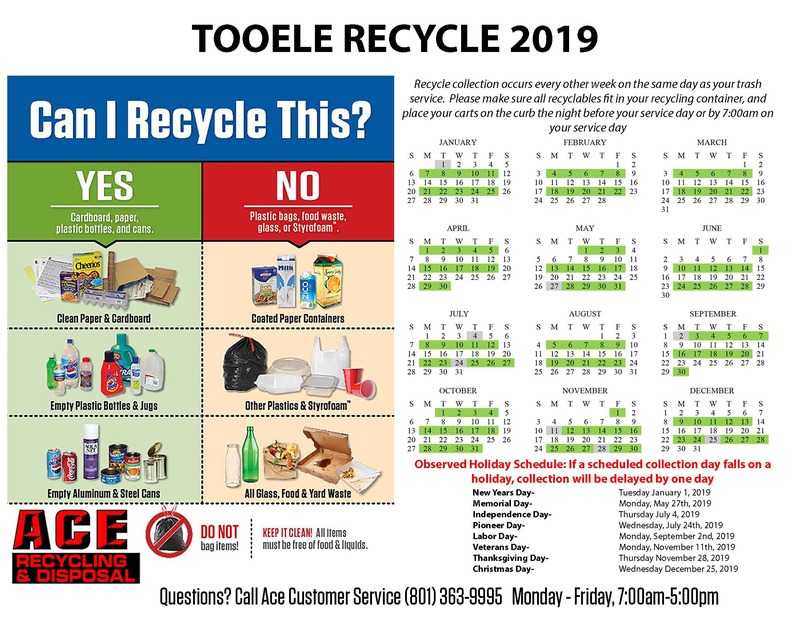 The Tooele City Curbside Recycling Program began February 2017. This service is available for residential customers who have a utility account with Tooele City. When opted-in, residents are delivered a blue recycling receptacle which allows for plastics, metal, paper products and cardboard to be recycled. As of September 2018 all items must be free of foods and liquids prior to placing them in the recycling receptacle. Green waste and glass will not be recycled. Recently there have been some changes in recycling policies. As you may have read, China’s recent import policies are affecting what we can put in our blue recycling bins. Here in Utah, recyclers are being much more particular about what materials they take, and we all need to work together to recycle better. Most importantly, we cannot accept food waste or plastic bags! When your recycling is picked up, it is taken to a sorting facility and any sort of stretchy plastic jams up their machinery. If you use a plastic liner in your home’s recycling bin, please dump the contents into the recycling bin and then put the plastic bag into the trash. 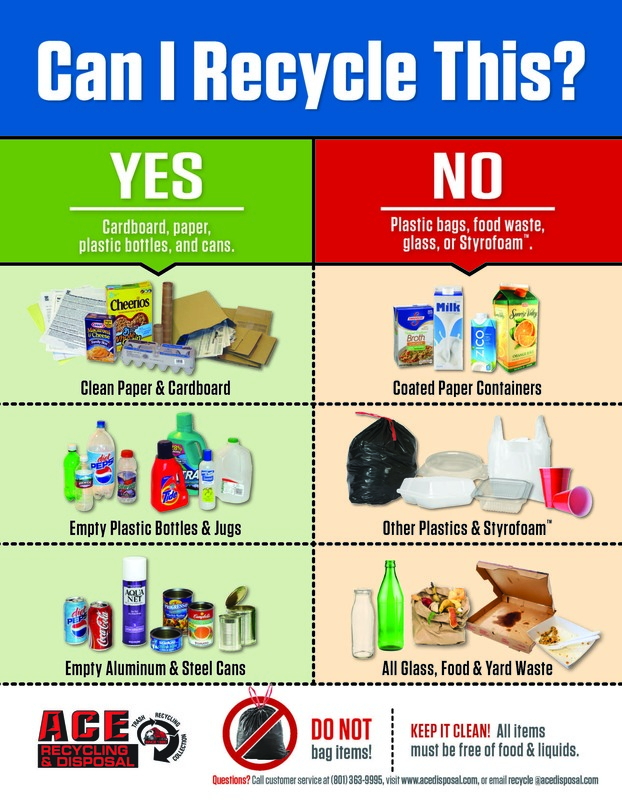 Food, yard waste, Styrofoam and glass are a big problem and cannot go into the recycling bins! Please help us keep our recycling program clean and affordable! If you have any further questions, you may contact customer service at ACE Disposal at (801) 363-9995 or visit www.acedisposal.com. The cost of this service is $5.65 per month per recycling receptacle. The pick-up of the recycling receptacle is every other week on the same day as your waste service. Please have your recycling receptacle out on your curb before 7:00 a.m. on your pick-up days. 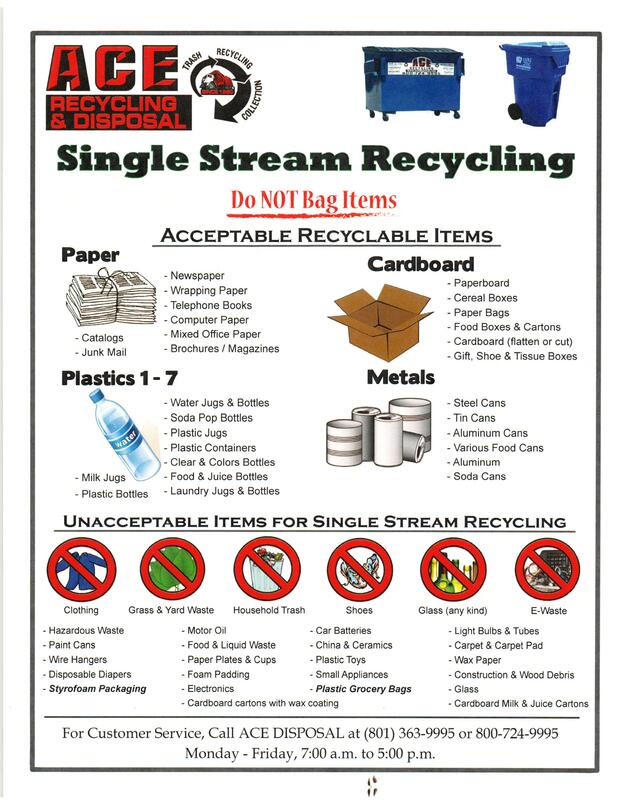 A pick‐up schedule and a list of items that may be put in your recycling receptacle will be provided with delivery of your receptacle. That information is also available on this page. Beginning May 1, 2017 residents may opt-in to the Curbside Recycling Program at any time. Once service begins, residents will only be allowed to opt-out of the program on an annual basis. If you have any questions or if you would like to opt-in over the phone, you may contact the Tooele City Finance Department at 435-843-2150. Thank you! Please be patient this may take a moment to process. A confirmation message will appear on your screen when your form has been submitted. Please note: The recycling bin that was in the gravel lot behind City Hall has been permanently removed.